The day is not that far away when you’ll hear a tippity tap at the front door and open it to find your friendly neighborhood pizza drone just waiting for you to collect your order (pineapple optional…). After all, it’s already happening in Australia. As it turns out, drones are pretty handy things to have around. They also have plenty of applications in the real estate industry. For example, did you know that home inspectors are starting to use them more for things like roof inspections? It’s a heck of a lot safer for everyone, plus they make filming and saving a record of the roof’s condition effortless. In the same way that inspectors are using drones to look at those hard to reach places, real estate agents are also taking advantage of the tech. Drones are Swarming the Market! Don’t panic, but drone adoption and utilization is taking off as the tech becomes more cost effective. 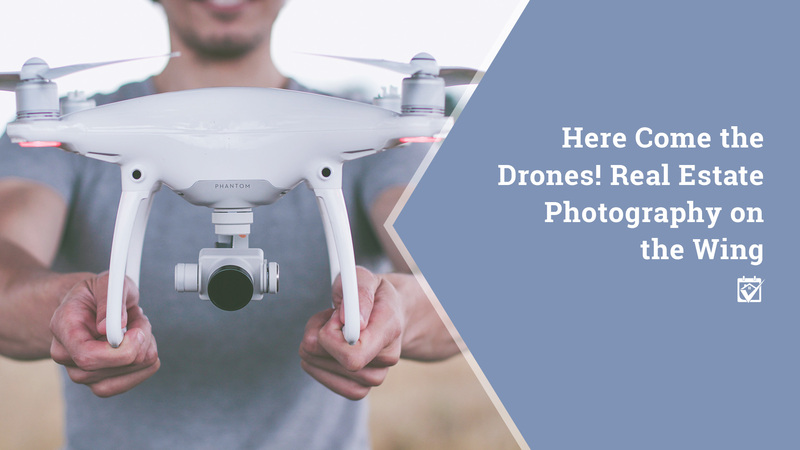 In fact, a variety of services have appeared to help real estate agents and others use drones to improve the overall story they’re trying to tell about a property. Drones are handy, even when they’re not delivering pizza. Improving the overall picture of the property. As more buyers rely on real estate websites to preview and eliminate homes during their search, it becomes vital that agents provide the most complete picture possible. A drone flyover can not only show the house in relation to the land it sits upon, but the relative size of things like pools, landscaping and walkways. Buyers can also use these flyovers to ensure that they’re not going to be walking into a house with a bedroom window six feet from a major road. Giving an overview of the whole neighborhood. Wondering what’s close to a house that’s otherwise perfect? Check out the video the agent provided. Using a drone to get a bird’s eye view of the neighborhood will show what’s reasonably walkable nearby and can also reveal problematic houses. Privacy fences hide a lot, but drones can reveal the truth of the matter before you buy a house in a neighborhood that isn’t right for you. On the flipside of this, some people have been complaining that drones pose a huge risk to their privacy by peeking over fences and into otherwise private yards. Documenting issues that may be otherwise hard to see. Drones are increasingly being employed to go into attic spaces and sent to hover over roofs in order to detect problems. If you were to sell your home, for example, it might pay to have a drone inspection of your roof and chimney so that you didn’t get any surprises during your buyer’s inspection period. As a buyer, hiring an inspector with a drone can provide much the same peace of mind since it’s easy to use these machines to document issues like hail damage and crumbling mortar. Drones have already been used extensively in the luxury home market, but their use certainly isn’t limited to that audience. Everybody likes a good fly-by, especially if there’s something really neat to see. For example, a house in a historic area may show particularly well in a drone video. Ultimately, drones are about adding more ways for buyers to get a good picture of the house in question. After all, no one has a lot of free time these days, but you can easily watch a drone video online, examine photos of a home you’re really interested in and then decide if it makes the short list over your lunch break without leaving the office. Are These the Drones You’re Looking For? Whether you need a drone video to really showcase your listing photos or you just want to make sure that your real estate agent doesn’t miss an opportunity to give potential buyers a better view of the place, there’s someone within my network that can help. You can even get recommendations for home inspectors that are using this technology! Ask me for referrals to the best people in the drone business!